To fully appreciate the Battle of Gettysburg, you need to start with the basics. This collection of TeachersFirst Editors’ Choice resources related to the Civil War -- and specifically the Battle of Gettysburg -- will give you the BIG Picture about the battle. Take the time to collect the basics, and then go back to the starting page and dive into the Numbers. You will never see history the same way again. Who? Who were the armies involved? Why were they fighting? Who were their leaders? When? What were the dates of the battle? How does this fit into the overall timeline of the Civil War? What? What happened at Gettysburg? List information about the days leading up to the battle, each day of the battle, and immediately after the battle. Include any important events during the battle, such as Pickett’s Charge. Why? Why do historians single out the Battle of Gettysburg from other battles of the Civil War? Why is it important or different? What else? What factors lead to the results of the battle? What happened in Gettysburg approximately four months later? Why was that November event important? Browse the reviewed resources below, or return to the starting page to begin exploring the numbers. Advise Abraham Lincoln as he makes important decisions that affect the future of the nation. History comes alive through this free interactive and animated educational activity. It's a cinch that your students will better understand what our nation experienced during Lincoln's presidency. Each of thirteen "chapters" of history comes with rich resources and hyperlinks. This activity could be used by individual students or in small groups. An interactive whiteboard or projector would also work fine. Since there is no right or wrong advice, students could tap in on the resources as they research to support their decisions and to speculate on how history might have turned out differently had Lincoln made other decisions. Perhaps have them write a blog post as Lincoln trying to make a decision. Have groups create multimedia presentations to share their decisions and possible outcomes. How about a podcast using a site such as PodOmatic (reviewed here). Or have students create news reports and video to share with the class. Share the videos using a site such as Teachers.TV reviewed here. The Library of Congress demonstrates the depth of its archival image and documents collection in this site, which records first-hand accounts of the accomplishments and difficulties of African-American soldiers during the Civil War. Although rather "plain vanilla" this site is definitely one to explore if you or one of your students are interested in the Civil War. The site could be the basis for dozens of lesson ideas, as well as an ideal starting point for a research paper. Have students view authentic letters from Abraham Lincoln on your interactive whiteboard or projector. Challenge students to write a letter (or a blog) in response to Lincoln's letter. The History Channel's addition to the broad, sweeping genre of American history series is America: The Story of Us (don't miss the play on words: Us/US), airing over 12 hours, two episodes at a time. Each episode is about 45 minutes in length. At the time of this review there were brief episode guides, video clips from episodes, a PDF version of a classroom study guide that can be downloaded for free, links to download episodes on itunes (for a FEE), and a number of other promotional links. You can also order the entire series on DVD. Some historians will turn up their noses as the History Channel attempts to cover the history of the United States in 12 hours, including commercials. Important issues will be missed, historic players will be overlooked, and complex topics will be over-simplified. However, it is precisely this sort of effort that can hook kids who aren't ordinarily interested in history in taking a second look. The History Channel is providing a lot of support for teachers who can use video clips for lesson introductions or reinforcement. At the very least, the teachers' study guide will provide you with some new ideas or resources! Share the relevant video clips on your interactive whiteboard or projector. Or, have cooperative learning groups each view individual videos and do a little more research substituting pen and paper notes with online notes using SuperNotecard, reviewed here, that can then be used as a storyboard to create a presentation about their topic. How about extending student learning by challenging them to create an interactive online brochure highlighting the important facts learned from the video and their research? Use a site such as Sway, reviewed here, for this. Civil War 150 is part of the Smithsonian National Portrait Gallery's commemoration of the 150th anniversary of the Civil War and the presidency of Abraham Lincoln. The site includes online exhibits, videos, educational resources, and blog posts. Choose from any topics to explore links that include images, photographs, short essays, and also videos. Also available is a large series of lectures and podcasts given by historians on diverse topics such as Lincoln's Beard - Why Did He Grow It? and Stonewall Jackson, Portrait in a Minute. Some podcasts are in video and they range in length from 3 minutes to almost an hour and a half. Some of the videos are hosted on YouTube. If your district blocks YouTube, then they may not be viewable. You could always view the videos at home and bring them to class "on a stick" to share. Use a tool such as KeepVid reviewed here to download the videos from YouTube. Listen to podcasts in your classroom and view videos on your projector or interactive whiteboard. Have students use Fakebook (reviewed here) to create a "fake" page similar in style to Facebook about a Civil War soldier or important person from that time. Have students create timelines of Civil War events (with music, photos, videos, and more) using Capzles (reviewed here). Commemorate the 150th anniversary of the Civil War with an interactive look at different aspects of the war. Choose from various main topics: "Who They Were," "How The Died," "150 Civil War Topics," "Weapons of War," and many others. 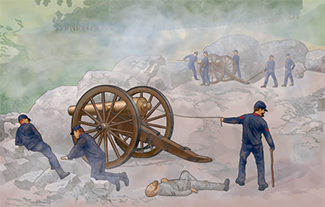 You will find a clickable infographics with facts and information about the Civil War. View several video clips, including Lincoln's Most Pivotal Speech, Confederate Bomb Plot, Gettysburg Battle Strategy, and more. Find out what the experts think were the most important events, battles, and cultural components of the Civil War. View the most popular topics to find additional information on people, places, and events. Mark this site as a Favorite for use during your Civil War unit. Share this site on your interactive whiteboard or projector. Show students how to use information from infographics and cite correctly using the "cite this" button located with each infographic. This site is perfect for student exploration. Challenge them to come up with their own top 5 lists to compare to the experts' choices. Another idea: have students create a simple infographic sharing pertinent information about the Civil War using Easel.ly, reviewed here or Venngage reviewed here. This site, created for students, by students, provides kid-friendly information about the Civil War - including a timeline of significant events, bar graphs containing data about the North and South, easy-to-read maps, depictions of Union and Confederate flags, and much more. Includes biographies of important Civil War-era personalities, links to related sites, and activity sheets. Use this site as a learning center or station to supplement a classroom unit on the Civil War. Have students look at all the aspects of the site, as some of the visuals are unique and provide something more tangible to bookwork and lectures. This site, created by The History Place offers a chronological listing of Civil War events (with pictures) and is easy to navigate. This site features topics such as Fort Sumter Attacked, Gettysburg, Shiloh, and several others. The timeline format is easy to understand. The photos are authentic and informative. Use this site for research about the Civil War. Have cooperative learning groups research various battles of the Civil War. Or have students create their own interactive timelines using a tool such as Timeglider, reviewed here. Experience images of the Civil War musicians accompanied by authentic fife and drum music of the times. As the caption explains, "Fifers drummers and buglers provided the beat to everyday life of the soldier." The creator of this video is a self-described Taps Historian and Bugler. If your district blocks YouTube, then this may not be viewable. You could always view the videos at home and bring them to class "on a stick" to share. Use a tool such as Tube Offline, reviewed here, to download the videos from YouTube. Play the music and video during an intro to your Civil War unit to grab the attention of auditory learners. Inspire students to find out why music was far more than entertainment for soldiers. Challenge students to learn more about music and other communication tools during the Civil War in TeachersFirst's Gettysburg by the Numbers. Our students are accustomed to having both audio and video content to the information they access. Consequently, just reading something like the Gettysburg Address can seem dry and sterile to them. This video provides both a rich reading of Lincoln's famous speech, but an accompanying video track to illustrate it. For those who are not strong readers, the audio-video combination provided here may make the concepts in the Gettysburg Address more accessible. For other students, there may be deeper, more complex questions sparked by the video. Did the creator of the video capture the concepts authored by Abraham Lincoln adequately? This video could be the "jumping off place" for a variety of questions the class might consider or project ideas for individual students. How might you do it differently? What about other well-known speeches or documents? How would you illustrate them for a similar video? Challenge students to create their own video accompanying a famous speech and share the video using a site such as SchoolTube (reviewed here). You know how TV documentaries highlight their explanations of war with cool battlefield animation? This site enables teachers to project animations on an interactive whiteboard or projector as a supplement to class presentations. The site has its limitations: at the time of this review, only animations of the Pacific theatre of WWII, WWII: Europe, the Civil War, and the American Revolution are available. More battles are promised for the future. The animation is rudimentary; moving dotted lines, the usual color-coded boxes to represent troops, and fairly primitive sounds. Students who are used to high graphic video games might even find the animation amusing, and middle school boys are sure to laugh at the "explosions" that represent conflicts. At the time of our review, our editors did notice a few typos in the text that accompanies the animations. Nearly all links worked at the time of this review. On the other hand, the site will provide visual learners with maps, the details of troop movement, and a good overview of the wars' major battles. Using this site is simple! Click on the war or your choice at the top. A list of battles will be provided on the left sidebar. Click on the battle that you wish to explore. For example, to find Gettysburg: click on The Civil War and then find Gettysburg in the left side bar. There is also quite an extensive amount of information about famous generals and more. The obvious use is to illustrate battles on an interactive whiteboard or projector during a lecture or class discussion. This site might also be useful as a link students can explore from home as part of a homework assignment or enrichment activity. Have students research this site and other information about their "battle" and create a multimedia project. How about a "talking map" indicating where a battle took place with audio recording. Use a site such asZeemaps, reviewed here. A group of talented future animators might be challenged to envision similar animations for battles that are not already included. Note that you can register on the site to be notified as future battles are added. Lincoln Learning Hub is the DreamWork's companion site to the movie Lincoln. Four main components are the core of the site: a timeline, What Would Lincoln Do?, Team of Rivals, and Who's Who in Congress. Click on the timeline to view an interactive display of events leading to the end of slavery. Click on images for a short synopsis of each event. What Would Lincoln Do? offers a look at what Lincoln might do if faced with other national crises such as 9/11 or women's suffrage. Click and drag images to match cabinet posts in the Lincoln administration after reading a short biography. Explore and learn more about members of congress during Lincoln's time in the Who's Who in Congress portion of the site. This site would make a great addition to any Civil War or Abraham Lincoln unit. View together on your interactive whiteboard (or projector). Create a link to the site on classroom computers. Use the What Would Lincoln Do portion of the site as a spring board for students to debate Lincoln's possible actions on other important world or national events. Have student groups or partners explore the activity and report to the class on their decisions. Challenge students to create a newspaper article about Civil War events using the Newspaper Clipping Generator. This site offers over 5000 maps from various times throughout history and includes ALL continents and many individual countries. With the advent of satellite technology, it's simple to get a current map of any area on the globe, sometimes down to the street level. What's more challenging is getting digital copies of historical maps, larger political maps, or reproducible maps. Maps ETC gives you access to maps of the world, browsible by continent. Maps ETC includes current maps, but most importantly, historical maps. Want a map of 19th century pre-colonial Africa? It's here. A pre-Civil War US trade and migration map? Got that too. The site is easily searched by gallery or by entire database. Maps are also available in PDF format so you can download and print for classroom use. Note however, the very specific terms of the license under which these maps are available. A limit of 25 maps can be used in a single project without special permission, and a link to Florida's ETC must be included when maps are used on websites. The license is clearly spelled out and would also serve as a good exemplar to use with students to teach them how to credit the resources they find on the internet. Each of the maps is available as a GIF or JPEG file to use on an interactive whiteboard (or projector), or to insert in a document or website. Use this site for nearly any historical research project. Have students make a multimedia presentation using one of the many TeachersFirst Edge tools reviewed here. Discover the music of the Civil War as a real musician. This collection of sheet music links, Army guidebooks, and more are intended for re-enactor musicians who plan to "go to school" to become field musicians. See the importance of music as a communication tool before, during, and after a battle. You can even try your own hand at playing a drum cadence. Many of the files are Acrobat scans of original music. These are not "beginner" pieces, but a musician with moderate experience could play at least some of them. Clicking on the link to Other Resources and Links can lead you to some musical re-enactor videos on YouTube. See listings under Civil War Field Music/Fife and Drum Corps. If your district blocks YouTube, then they may not be viewable. You could always view the videos at home and bring them to class "on a stick" to share. Use a tool such as Tube Offline, reviewed here, to download the videos from YouTube. Share this resource as a project option for your musical students during a unit on the Civil War. Share the site with your music or band teacher to collaborate on a Civil War Day event. Understand the thoughts and emotions of the men who fought in the Civil War through poetry and music of the time. Choose from Confederate or Union Poetry or Music of the War links. Listen to popular music of the day such as Oh! Susanna and My Old Kentucky Home. Explore poetry separated into categories including battles, soldier life, and the home front. Other options for exploring the site include searches by title, first lines, and authors. Include this site with your Civil War unit resources. Have students upload a photo they have taken and add voice bubbles to explain what they learned using a tool such as Superlame, reviewed here. Or challenge cooperative learning groups to use one of the many other multimedia presentation TeachersFirst Edge tools found here.